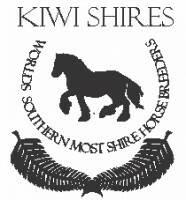 Kiwi Shires are a newly established Shire Breeding program in New Zealand. We have been working in partnership with Southwind Shires NZ for a number of years and have now acquired a lot of our mares from them. With the recent acquisition of “Southern Cross Dark Knight” we are excited to see the Shire Horse thrive and increase in New Zealand.